Looking east on Second Avenue on Monday: Newly planted trees and lights on surprisingly tall poles. After a few days away in Southern Oregon, I went downtown Monday and found newly planted trees and street lights that hadn’t been there before. 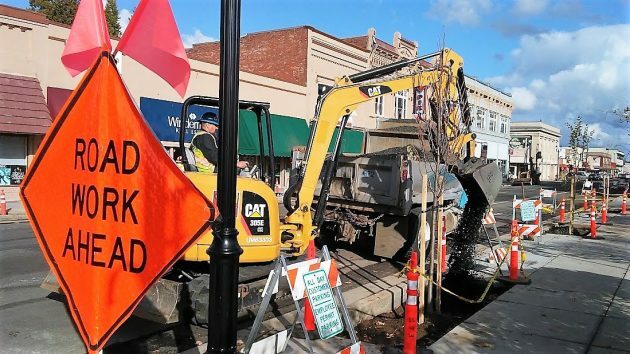 You’ll no doubt remember that about 130 trees were cut down all over downtown last winter as part of the $8.4 million streetscape beautification program sponsored by CARA, the Central Albany Revitalization Area. They were to be replaced with 225 new trees at the rate of about 10 per block. I was surprised by how tall the new lamp posts are. The acorn shape of the lamps themselves is supposed to make them look as though they belong to the Victorian era. Let’s just hope that they are bright enough to light the streets and sidewalks far below. 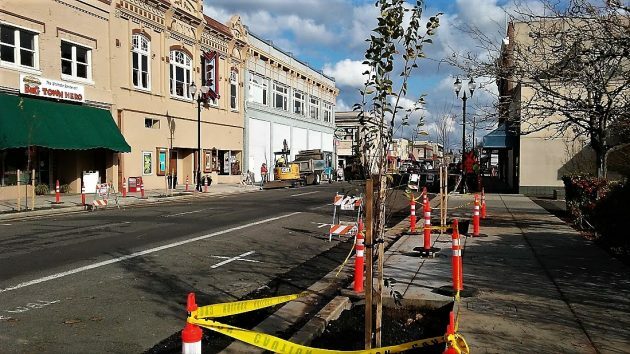 Planting of the trees now is scheduled to be complete by December, as is the reconstruction of downtown sidewalks. The street lights won’t be lit until early next year, though, according to an Oct. 24 “construction notice” put out by Lindsey Austin, project manager. Downtown merchants, residents, employees and customers will also have to wait until 2018 for the installation of new street furniture and the final paving of the streets themselves. After that, it’s a matter of watching the trees grow and waiting for them to reach the size of the ones that were cut down. Gravel gets added to one of the tree wells on Second Avenue Monday afternoon. Your audience awaits your next chapter in what seems destined to be a decades-long story. Follow the money.